Mazda has a proven record of superb drivers cars, and for drifting this is no different. 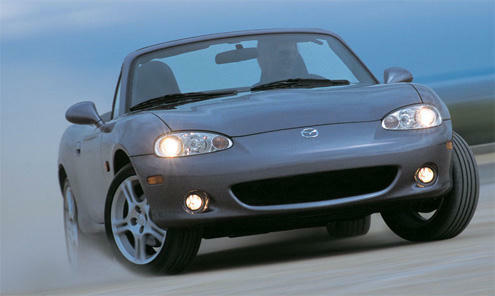 If you are looking at Mazdas for sale then you have several options, from the superb MX5 to the exotic RX7. The most popular sports car in the world is known to be a girls car. But how wrong would you be to dismiss it as that! One of the greatest drivers cars of all time, the MX-5 is also a superb drift car in its own right. Not just the new muscular looking NC MX-5 but even the mk1 NA and mk2 NB MX5s have got that great balance which ever drift car needs, and at a great price. Cheap early MX5s can be picked up for around £1500 if you shop around, although they are usually imports badged as Eunos Roadsters. So obviously take caution and look for good constant servicing and log books. First/2nd Gen MX-5s have 1.6 or 1.8 litre engine and have 120bhp (1.6 litre first gen) to 140bhp (1.8 litre second gen) with 0-60 in 7.9s. Limited edition Mazdaspeed MX5 has a turbo charged 180bhp engine, which differs to the standard 1.8 engine. The latest MX-5 has a 1.8 or 2.0l with the 2.0 having 160bhp in Euro/JDM spec. If your looking for something a bit different when it comes to drifting, it makes a sound choice. As one D1GB owner has already done. For a mk2 expect to pay £3500 for a good model. The superb Mazda RX7 has spanned nearly 30 years, and still excited with its evokative rotary engine. We'll concentrate on the more familliar in UK FC series and FD3S. The older FC's can be picked up for less than £1000, but dont expect it to be that good nick. However despite this, it has great potential. The superb RX-7 Turbo II has 182bhp rising to 200bhp with the Series 5, dubbed simply "Turbo". Known as the Savanna RX-7, it has a lightweight chassis, and with its looks is bound to make comparisons to the untrained eye with the ae86 Corolla. In reality this is a much more focused sports car, and the stunning looking convertible is more than equal to the coupé. Only downside are UK parts are less available than the newer FD3S, but again if you want something a bit different this is where to go. The newer Series 7 and 8 RX-7, the FD3S provides the body shape many know of today. Superb in stock, and potentially wild in tuned form, the body and rotary engine can be hugely transformed. The tuning of the 13B-REW can be raised easily to 400bhp from the standard 255-280bhp (depending on year) of the twin turbo RX7. Standard 0-60 is 5.1 to 5.5 seconds depending on year with special editions such as the Spirit R dropping this to 4.9s. The Spirit R has carbon fibre parts, as does the RZ, but as RX-7s are relativbely well known in the UK they have a good following, means body kits, performance parts etc. are all easy to find, and not that expensive. Don't believe stories that the rotary engines are unreliable. They are not! Just make sure that they are serviced regualary and in fact they are more reliable, as they have less moving parts. However if you get a bad one, expect above average expense. Because of this we recommend £3000 on an average-good FD3S, as anything cheaper could be a money pit..